Tampa Bay Lightning general manager Steve Yzerman stepped down from his role during a press conference Tuesday. Yzerman said he will become a senior adviser to Julien BriseBois, who will be the team's new general manager after serving as an assistant GM. 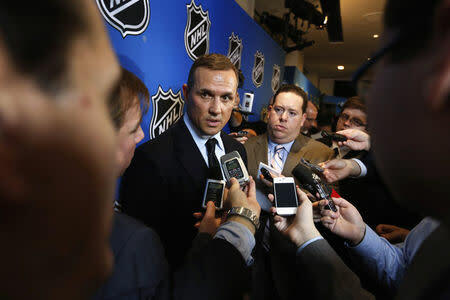 Yzerman, 53, had been general manager of the Lightning since 2010. He was entering the final season of a four-year contract, and the team had been hopeful to sign him to an extension. However, travel between where his family lives in Detroit and Tampa Bay had become difficult, and he said his decision not to re-up with the team came in late July. Yzerman was named the league's General Manager of the Year for the 2014-15 season. During his tenure, the Lightning have won a conference title and a division title and made the playoffs five times. "In the role I am in, I am 100 percent committed this year, and we are going to do everything we can to win and have as successful a season as possible," Yzerman said. "Beyond this year, I don't have an answer." BriseBois, 41, becomes the third-youngest GM in the NHL behind John Chayka of the Arizona Coyotes (29 years old) and Kyle Dubas of the Toronto Maple Leafs (32). BriseBois previously served as vice president of hockey operations for the Montreal Canadiens. "The reality is, in terms of being the guy and the decision-maker, I've been doing that for 12 years at the minor league level," he said. "The amount of autonomy I had in overseeing our player development both in Montreal for four years and my eight years here with Steve, I pretty much had carte blanche to run the program. So with regards to being the guy that has to make the decision, I'm comfortable with that, I'm used to that. "I'm well surrounded by the people that we have in our organization and I'm excited about that, the fact that I'll be able to count on really good people that are good at what they do."